Are you ready for the challenge that will change your life? Meal Replacement Shake - your choice of chocolate, vanilla, or berry: Complete nutrition in a great-tasting shake! 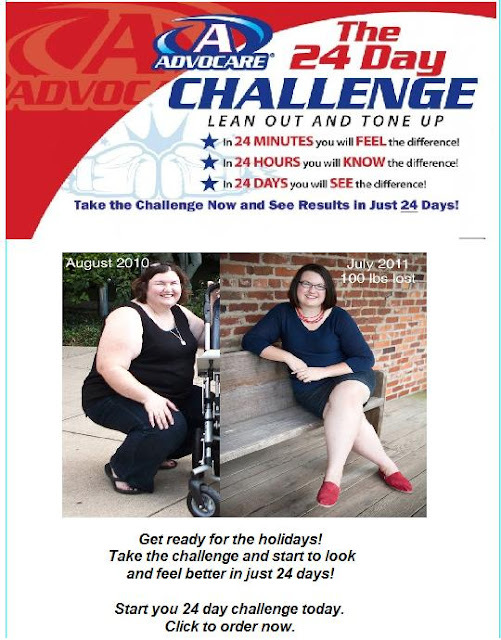 Start your 24 day challenge today. Also available at our spa. Look fantastic this holiday season from head to toe! The Holiday Glam Package is designed to prepare your skin & body for the holidays at an affordable price! Body Contour Wrap to get rid of inches, detoxify, and get your entire body glowing! Mineral Make Up Application with Lesson-Look great at the end of your visit and learn some make up tricks! That's a SAVINGS OF $200! *May not be combined with groupons, living social vouchers or other specials. To Reserve your Glam Package call us at 615-794-5282 or Purchase Instantly Online!